Kindergarten friendships of high quality could signify fewer behavior problems and better social skills for boys in first and third grades, shares Nancy McElwain, associate professor of University of Illinois and co-author of a study published in a recent issue of Infant and Child Development. "The findings for girls were different," said Jennifer Engle, lead author of the study. "Overall, teachers reported that girls in the first and third grade had good social skills, regardless of the quality of their kindergarten friendships. Boys, on the other hand, clearly benefited from the good start that early high-quality friendships provide." 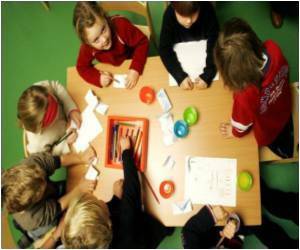 Engle said the study was unique in comparing how the presence and quality of children's kindergarten friendships are related to their behavior problems and social skills in kindergarten, first, and third grades. She noted that friendship quality was important for both boys and girls in kindergarten. Kindergarten kids with high-quality friendships tended to have fewer behavior problems and better social skills than those whose friendships were of low or moderate quality. In contrast, kids who had low-quality kindergarten friendships had more behavior problems during kindergarten. The differences in friendship quality for boys versus girls didn't show up until the children were older, she said. "Boys who had no friends in kindergarten had more behavior problems, but not until they had reached first and third grades," she said. The researchers examined data from 567 children who had participated in the Eunice Kennedy Shriver National Institute of Child Health & Human Development Study of Early Child Care and Youth Development. Mothers in the study reported on whether their kindergarten child had at least one friend and on the quality of their child's friendships. Researchers then compared the progress of children with no friends, low-quality friendships, average-quality friendships, and high-quality friendships. Teachers provided feedback on children's behavior problems in kindergarten and first and third grades. "As we expected, high-quality kindergarten friendships that featured cooperation and sharing, taking turns, low levels of hostility, and little destructive conflict, gave children—especially boys—practice in positive interaction, which they demonstrated in grades 1 and 3," Engle said. How can you help your child learn to be a good friend? McElwain stressed that peers become important as children enter kindergarten. Parents should make an effort to help children, especially boys, make friends at this age through play dates and other social activities, she said. Children also will likely relate to friends in more positive ways if they have experiences in their family that model positive expectations, caring, and respect. When children learn to expect that people will respond positively to them, they will be responsive and friendly to others, she noted. "Those children will be able to handle their emotions better when the going gets rough, and they'll learn how to work through conflicts. Conflict isn't necessarily good or bad; it's a matter of how kids approach disagreements with their friends or parents," she said. McElwain offered reassurance to parents of friendless kindergartners. "Almost all of those children had made a friend by the time they reached third grade," she said. Depression and anxiety symptoms in school-aged children halve when parenting styles match the child's personality, a new study has found.